Cornwall's tech sector has long been fragmented and invisible. Now, thanks to the efforts of Software Cornwall, it seems to be gathering ground. 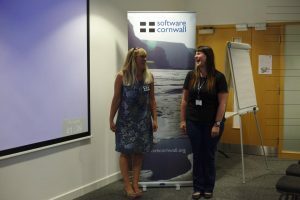 Last Thursday, David and I had a brilliant time at Software Cornwall Business Connect, talking to Cornwall’s burgeoning tech sector about how to make copy work harder for their business. And what an amazing sector it’s shaping up to be. I’ve always known there were interesting people and projects around, and I know that last year’s Tech Nation survey revealed Cornwall to be the second-fastest growing tech cluster in the UK, but I’ve never had a clear sense of the sector as a single organism. Perhaps this is because Cornwall is a rural county, with its geeks and tech firms dispersed among its many towns and villages – most of which, thanks to a recent £132m project backed by EU regional development funds, are now served by Cornwall’s superfast fibre broadband infrastructure. Or perhaps it’s because, until recently, the sector had no cohesive force, nothing to bring it together and give it a group identity. What’s holding Cornwall’s tech cluster back? Our tech firms have lacked the conditions that have given rise to other, more readily-identifiable tech clusters. They aren’t gathered around a roundabout, incubated en masse by a VC firm, or spun out of a nearby university. There’s no TechCrunch or Wired equivalent here, not a single locally-based tech journalist to document the rising fortunes of the scene and the companies within it. The only regular column inches devoted to the industry are a single A4 page in the generalist monthly Business Cornwall magazine. There isn’t a huge local software giant that people leave to set up their own software companies, in the way that Oracle spawned Salesforce.com, or Twitter spawned Square. Arguably Cornwall’s most internationally-famous software company, the universally-adored writing app Scrivener, is run by a tiny team in Truro and seems reluctant to admit that it even is a software business. And there isn’t – yet – a local industry sector that’s prepared to co-innovate with local tech companies to gain competitive advantage, like the cybersecurity cluster that’s sprung up around GCHQ in Cheltenham, or the massive high-tech cluster in Israel that was born out of (and continues to be driven by) government investment in military technology. By contrast Cornwall’s industries, for the most part, are traditional ones: tourism, fishing, agriculture, food and drink. Production is mostly done on an artisanal rather than industrial scale, favouring a homespun approach over an automated one. For better or worse, you’re unlikely to see many Cornish apple growers experimenting with the internet of things, or B&B owners using real-time analytics to lure weary travellers stuck in traffic on the A30. And as the vast majority of Cornwall’s businesses are micro-firms with fewer than 10 employees, there’s little spare cash to experiment with software innovation. So with no central location, VC firm, university, publication, big company or dominant industry to give it focus and definition, Cornwall’s tech scene has always felt quite frustratingly fragmented. 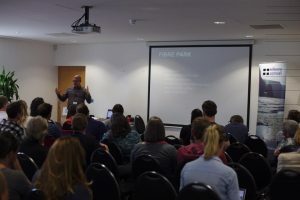 There have been some valiant attempts to bring it together: during my time in Cornwall I’ve seen a variety of tech-focused Meetup groups, Tuttle Clubs, hackerspaces and Ignite-style events spring up, several of which are still going strong. But most of those groups have had the aim of bringing people together to share interests, rather than to evangelise the sector to the outside world. 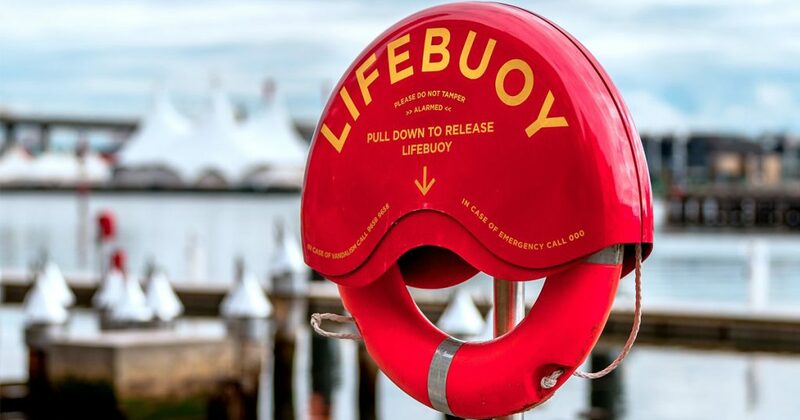 Can Software Cornwall make the difference? So the story of Cornwall as a tech cluster has gone largely untold. 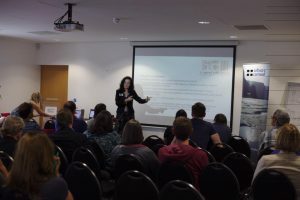 But I think that started to change last week, at the inaugural Software Cornwall Business Connect event. Software Cornwall is a collaboration between some of the county’s bigger software companies, education institutions and business support providers. 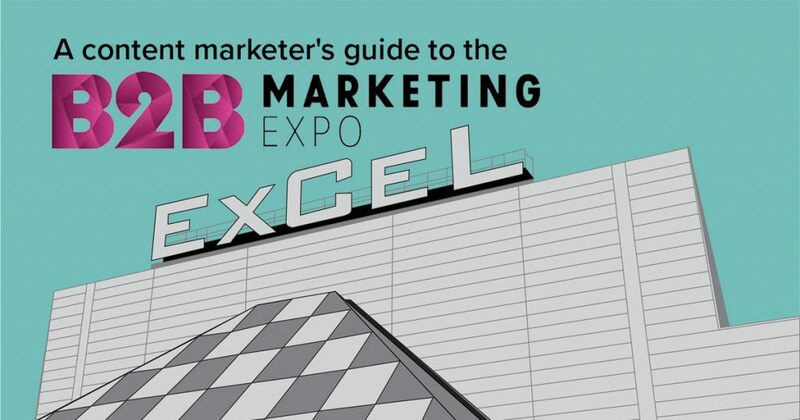 It aims to promote the sector nationally and internationally, in order to attract tech talent and inward investment, and to encourage tech businesses to relocate to Cornwall (with its superfast broadband network, glorious beaches and countryside, and comparatively low cost base). Another aim is to forge collaborations between local tech businesses and educational institutions, to develop home-grown digital skills to fill the new jobs created by Cornwall’s tech growth. 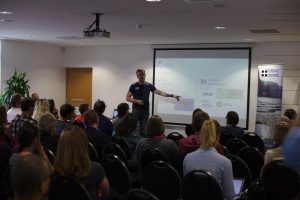 So here it was, last Thursday, doing all of those things at the first ever, completely-oversubscribed, Software Cornwall Business Connect event. 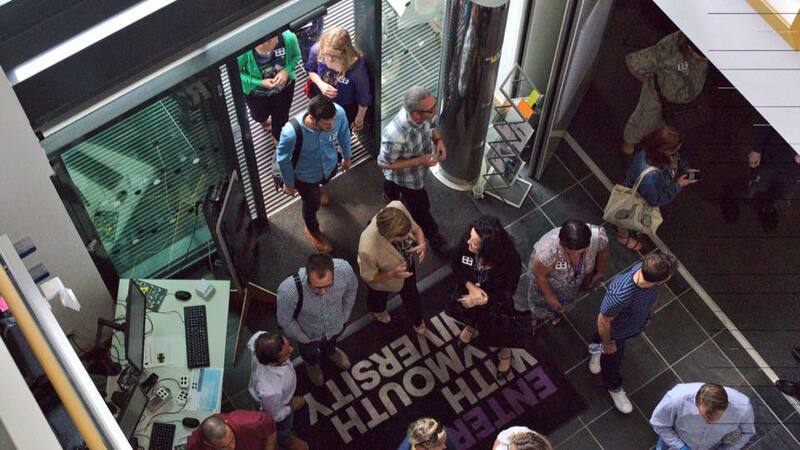 Here, gloriously, were 150 delegates from Cornwall’s tech sector (plus David and me, lowly tech copywriters), gathered together in the Pool Innovation Centre, to show each other and the world what they’re up to. Headforwards, the software outsourcing company, announced it was creating 42 new jobs for Python, .Net and Java developers, to work on projects for UK and international blue-chip companies. 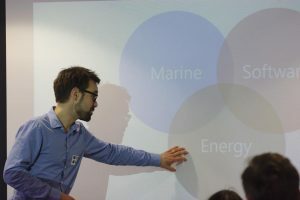 Mojo Maritime, consultants to the marine renewable energy industry, gave a tantalizing glimpse of the potential for collaboration between software firms and Cornwall’s growing renewables sector. App developer Hi9 launched Deko, a “Snapchat for bookmarks” that gives web newbies – people who have previously been digitally excluded – an easy way to navigate among essential apps and services. CryptoFintech, a company so new it doesn’t yet have a name, gave us a taster of their forthcoming “Paypal for direct debits” software. Cornwall College and Bluefruit Software launched I Am Digital, a new initiative where 16 year old students can gain their Technical Baccalaureate while working on real projects in Bluefruit’s offices. Toby Parkins of Headforwards revealed the latest plans for Fibre Park, a super-connected office complex with onsite support services for tech firms. 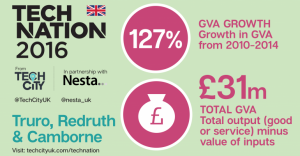 PFA Research debuted its plans to survey and document the extent of Cornwall’s tech sector in more granular detail than Tech Nation (which, perplexingly, located the entire cluster in just three towns). And, thanks to the presence of Tech South West, an organisation that aims to represent the tech businesses of the south-west of England on a national and international stage, there was a real sense that Cornwall could soon rival Silicon Roundabout and Silicon Fen as a must-locate UK destination for tech startups and established firms. 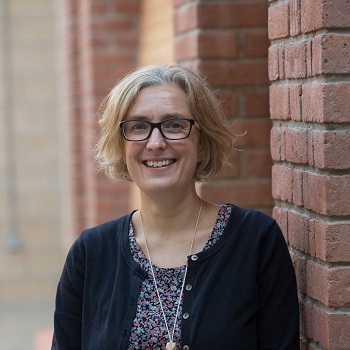 And if Cornwall does start to make a global name for itself as a high-tech hub, a metric tonne of the credit must go to Software Cornwall’s Belinda Waldock, who – along with Headforwards’ Lyssa-Fee Crump – is working astonishingly hard to get it to happen. I can’t wait to see what happens next.